Your face is usually the first thing people notice about you. No wonder so many people are concerned about their face’s appearance, particularly as they age. But what do you do about it? Many people’s first thought is to get a face lift, but plastic surgery isn’t necessarily the best option. Many of the benefits of a face lift can be created through cosmetic dentistry. As people are living longer they are looking for techniques to stay young looking. As you age the lower third of the face gradually shrinks. Cosmetic dentistry can revitalize this area, making you look as much as ten years younger. Over the years many people grind down or lose their back teeth, causing a caved-in look in the face. A “face lift” smile makeover lengthens your back teeth to give a younger, fuller look to your face, including your lips and cheeks. On the other hand, your problems might just be with the lips. Replacing any missing front teeth or adding porcelain veneers to the existing teeth can help make your lips look fuller and younger. Another effect of the aging process is that your teeth grow darker and more translucent. The appearance of the teeth can even make you look older than you actually are! Tooth whitening procedures are a quick and inexpensive way to rejuvenate your teeth and improve their appearance. Your teeth can get up to seven shades whiter – often in only one or two office visits. If you are unhappy with the shape of your chin or jaw, oral maxillofacial surgery may be the best option. Such procedures can improve the appearance of thin lips or a disproportionately sized jaw. This is an option to consider particularly if you are experiencing some functional difficulties with your teeth. Some or all of the procedure may be covered by health/dental insurance or may be tax deductible. When debating the merits of plastic surgery versus cosmetic dentistry you should think about the time and energy surgery requires. You will need to visit with the surgeon, set up a time in the hospital, undergo the surgical procedure – and then have weeks of recovery time. On the other hand, most cosmetic dentistry procedures can be done in the dentist’s office, without the risks and difficulties of general anesthesia. The procedures tend to be fast and recovery time is usually a matter of days, if at all. 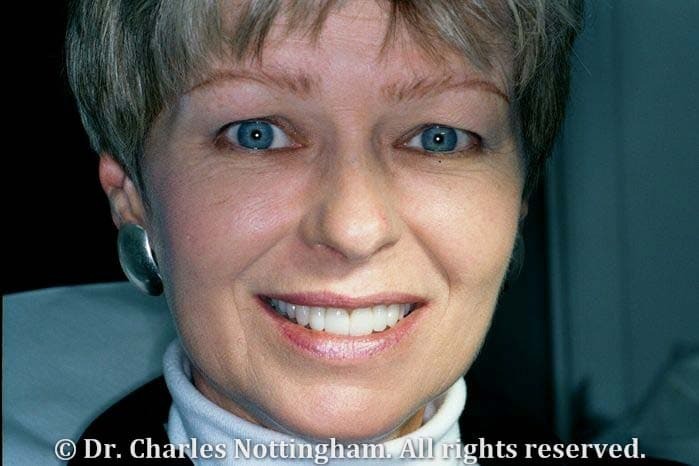 Of course, it is often the case that the teeth and soft tissues of the face must work together. After all, a good strong line of teeth will provide needed support for the facial muscles – whether or not you also get plastic surgery. If a patient wants extensive changes to his or her appearance, the best approach might be to have cosmetic dentistry and plastic surgery procedures that complement each other. For example, a patient might have tooth whitening and other procedures to look younger, but then might want to have plastic surgery around the eyes to correct drooping lids or wrinkles. Or a dental smile makeover might be necessary to ensure that the mouth area remains youthful looking for years to come after a plastic surgical procedure.